Imagine a world where the great minds of theology, mythology, and philosophy are forced to battle it out to become the dominating intellect. This world can be found in Set Yet in Motion, Alaina Hammond’s cerebrally charged comedy. Cassandra is having some problems with Apollo so she calls upon God, the Judeo-Christian one, to take care of him. God appoints Immanuel Kant to do the deed by killing him with an arrow. Along the way, Kant philosophizes with his buddy Johannes Climacus and gets seduced by Friedrich Nietzsche, now in female form. Set Yet in Motion builds upon a fantastical battle of philosophy that never gets old. And to make the discussion entertaining Hammond uses theatrical comedy as her device. There is no denying that Hammond is a smart writer. She fills her script with jabs and jokes. But unless you happen to subscribe and understand the schools of thought and know all the references, Set Yet in Motion becomes too heady and unfunny to those not in the know. What Set Yet in Motion seems to be missing is accessibility. Using iconic characters as a way in is a great start. But the material, and subsequent portrayal of the characters, has to find a way to allow everyone, even those who know little to nothing on philosophy and religion, in. As far as entertainment value goes, Hammond and director Michael Bordwell try to incorporate physical comedy and sight gags as a means to garner laughs. And it actually could have worked with the right group of performers. Sadly, the ensemble didn’t quite fit the needs of the piece, with perhaps the exception of the gender-benders. London Griffith as Nietzsche went all out in her performance. And it was fun to watch. Katherine Wessling was dominating, and funny, as God. Her material may have been the strongest of Hammond’s script and Wessling capitalized on it. With the story ultimately falling on the back of Immanuel Kant, Vincent Bivona was forced to step into a geeky leading man role. Bivona wasn’t quite able to live up to the challenge. Casting can play a huge part into the success of a play. If the actors aren’t quite grasping the text, it’s hard to ask an audience to play along. 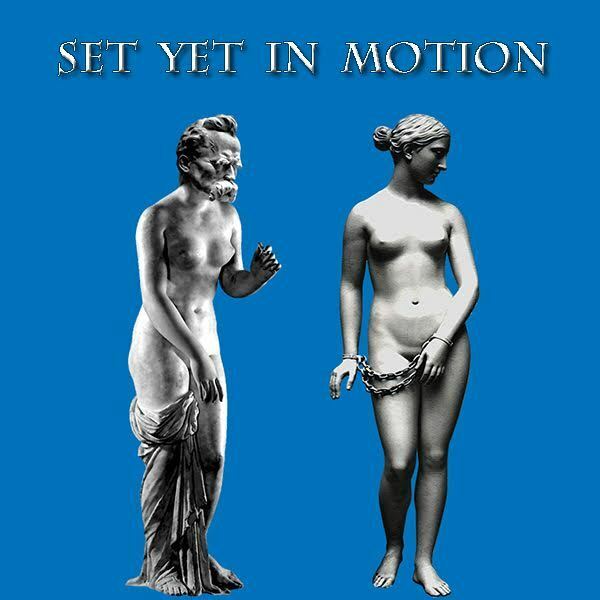 Set Yet in Motion is a smart script. But this ensemble didn’t quite seem like the right fit.